Banner (Forms) will receive a facelift in mid-July! The new look & feel will also remove the reliance on JAVA and remove the current browser restrictions. The update is purely a facelift to the interface, which means that no processes or data will change as a result. You will still use the same form names (SPRIDEN, etc), but will now have additional ways to access the same forms quicker and easier! The update to the Banner Forms interface is also referred to as Banner 9. This update is the foundation for a number of usability updates that will be made available in the coming months. Enhancements to Banner 9 include a cleaner, more streamlined, and responsive design as well as an additional navigation helper menu (Application Navigator). With Application Navigator, simply start typing the form name or keyword and you will be presented with a list of matching forms. Perhaps the most anticipated changes is that Banner Forms will no longer require JAVA, which means that more browsers, such as Google Chrome, will now be supported! 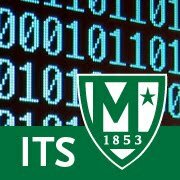 If you are already a Banner user, access to the Banner 9 TEST system is available at https://banner.manhattan.edu using TESTDB02. Please visit the TEST system to try the new features! A short 20-minute online tutorial is also available to better explain the new interface. Phishing Attack "Ushering Job This Weekend"
Phishing Attempt - Don’t be Fooled….